As work on the pool is nearing completion, I want to take a moment to extend my appreciation to the citizens of Sandwich who supported the funding to repair the Sandwich pool. Three years ago, when the decision was made to move grades 7 & 8 to the high school, I made the case that adding 530 students to bring the population to nearly 1300 students, would require two teaching stations to meet physical education requirements. Those two stations are the gymnasium and the pool. The well publicized issues with the 45 year old pool caused us to function with just the gymnasium in our inaugural year of the STEM Academy. Classes of over 130 students had to function with the gymnasium, and to the credit of our physical education teachers and with the cooperation of students, Sandwich conducted a safe program, but certainly a more limited program than anticipated. Now with a little over five weeks before students return to school, pool repairs are nearing completion. On the morning of July 30, I had the opportunity to tour the pool facility with three school committee members who have formed a workgroup to address the goal of providing public access to the pool. Before I tell you more about that, I want to commend the work of Wendy Pierce, the Aquatics Director for our school programs. Wendy is incredibly knowledgeable when it comes to pool operations and serves as the Certified Pool Operator (CPO). While serving as the onsite supervisor for the various construction vendors, Wendy worked to develop the curriculum and plan programs that will be used in the schools. She had a key role in the actual painting of the pool walls, and her tiling skills were put to use to repair areas where the bonding cuts were made through the deck surface. She was assisted by Jim Petit from the facilities department. She also conducted aquatics training classes for physical education teachers. This fall, Wendy will have a very full teaching load, and significant responsibility as the CPO for safe pool operations. She has also been working with teachers of our special needs students to plan programs for them. We are especially pleased that students can elect a senior lifesaving class that can help them with summer employment, and help the Cape address the shortage of lifeguards. By virtue of being located within the school, the pool is legally under the “Care, custody and control” of the school department, and Wendy and Alan Hall, our Director of Facilities, have been working on plans to enhance security. Our swimming and diving teams, under Coach Tony Compton, are eager to get back to their home pool, and our engineering students are looking forward to an opportunity to host a regional submersible robotic competition. 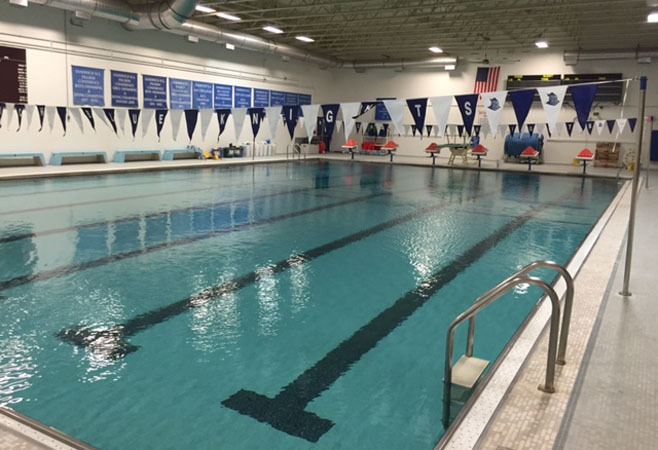 While the schools have met their goal to prepare for student use, the Sandwich School Committee and this Superintendent of Schools support the community use of the pool. How expansive that use will be is yet to be determined. At its high point, there were never more than 400 adult pool users, and many were non-residents. However, similar to a YMCA or Recreation Department program, opening the pool to non residents helps generate revenue needed for use beyond the school department operating budget. There is also another reality, and that is that pools do require some capital investment over time. Properly managed, a fee-based program can help generate funds to help offset capital funding needs that natatoriums of this size will require. The School Committee workgroup is led by Jay McGrail, and includes Nancy Crossman and Stephanie Hall. The workgroup is reviewing sample Requests For Proposals (RFP) that could be used to identify an outside entity to operate the pool on evenings, weekends, and during summer hours. There is a lot of work ahead for the workgroup as they seek to determine the parameters that would protect school and town interests, while making this beautiful facility available beyond the planned school use. The workgroup anticipates the ability to move ahead with the planned entry at the back of the pool that would eliminate the need to enter the main part of the building. While locker room use would be limited, access to bathrooms must be accommodated, and plans to address this requirement will be considered by the workgroup. The workgroup will receive consulting support from the superintendent, facilities director, aquatics director, administrator for athletics, and high school principal. Decisions need to made that would not jeopardize the high school’s accreditation with the New England Association of Schools and Colleges. The facility modifications and RFP process will take time, but for this fall, we should all celebrate this milestone as our students return to classes. Today, as one enters the natatorium, the pool is filled and it is holding water. The walls that were painted white and the stainless HVAC ductwork make the space brighter. Two very large ceiling fans add to the efficiency of air circulation. It is amazingly quiet, and any odor of chlorine is virtually undetectable. The filtration system is functioning properly, and the water is chemically balanced, just needing to heat up a bit more. Now we await some final inspections and approval from the building inspector to occupy and use the natatorium. The new starting blocks donated by the Melanson Family in honor of Christopher Melanson. 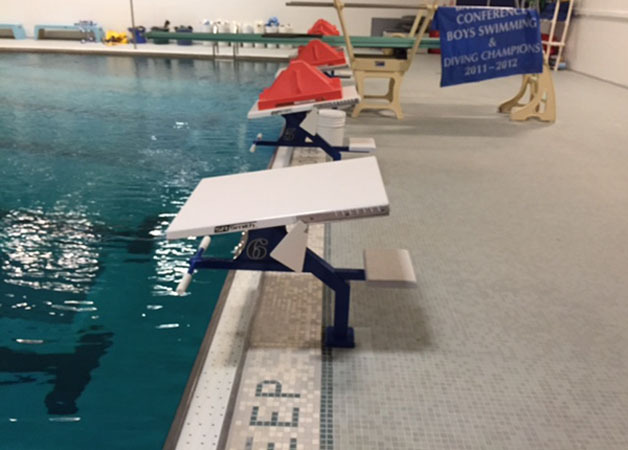 As you look at the pool with its new and more compact handicap access chair, its Olympic caliber starting blocks, the new lane lines, purchased through the generous donation of the Melanson family, one can imagine the excitement of the first swim meet. New blue and white backstroke pennants with the Blue Knight logo, express the pride and appreciation of our Knights and Squires for support from the residents of the Town of Sandwich.